ALL PARTS, INCLUDING CRYSTAL STOPPERS, ARE 100% ORIGINAL. 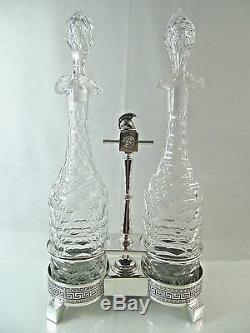 MAGNIFICENT ANTIQUE SILVER PLATED STAND WITH HAND CUT CRYSTAL WINE DECANTERS - BOTTLES. PROBABLY AMERICAN, CIRCA 1870'S. SUPER FINE QUALITY HAND CUT CRYSTAL. SILVER PLATED STAND DECORATED WITH "GREEK KEY", MEDALLIONS AND GREEK HELMET HANDLE. STAND IS MADE OF HARD METAL - BRONZE OR BRASS. (39 7/10 cm) tall including stoppers and about 8 7/8 in. (22 6/10 cm) wide at the base. Each decanter is just under 15 in. (38 cm) tall including stopper. Crystal decanters are excellent, no problems or repairs. Minor chips at the bottom on each crystal stopper - don't downgrade appearance or functionality. Silver plated stand shows minor expected wear, nothing more then charming indication of age. Some wear to silver-plating, minor dings and scratches. SUPER FINE QUALITY ANTIQUE WINE - DRINK - BAR RELATED ITEM - ABSOLUTELY STUNNING! ALL ITEMS ARE GUARANTEED AS DESCRIBED. Your satisfaction is very important to us. Items must be in their original condition with similar of our packing. Although every effort is made to ensure accurate dimensions and weights, the figures shown should always be treated as approximate. The pictures should be considered as part of the item description. We do not take responsibility for any personal or third party losses. The item "ANTIQUE SILVER PLATED STAND / HAND CUT CRYSTAL DECANTERS BOTTLES LIQUOR WINE bar" is in sale since Monday, January 4, 2016. This item is in the category "Antiques\Other Antiques". The seller is "silverapple" and is located in PA. This item can be shipped worldwide.